This is my favorite image we created in 2009. I think that shows the enduring quality of our modern yet traditional style. This image has won numerous awards from Professional Photographers Association and the South Carolina Association of Wedding Photographers. The bride, Alicia, traveled from Alabama to have her bridal portrait session at Chattooga Belle Farm, a 38 acre working farm and event barn in Long Creek, SC . Chattooga Belle Farm is one of our very favorite wedding venues for an outdoor mountain view. Their open air barn with vaulted ceiling faces the most beautiful view in South Carolina I have ever seen. The farm is an hour and a half drive from downtown Greenville, but well worth the trip. From Chattooga Belle you are blown away by a 180 degree mountain view that includes Highlands NC, Cashiers NC, and Clayton, GA. The farm is made up of vineyards and orchards dotted long the rolling hills, with the stunning Blue Ridge Mountains as your backdrop. 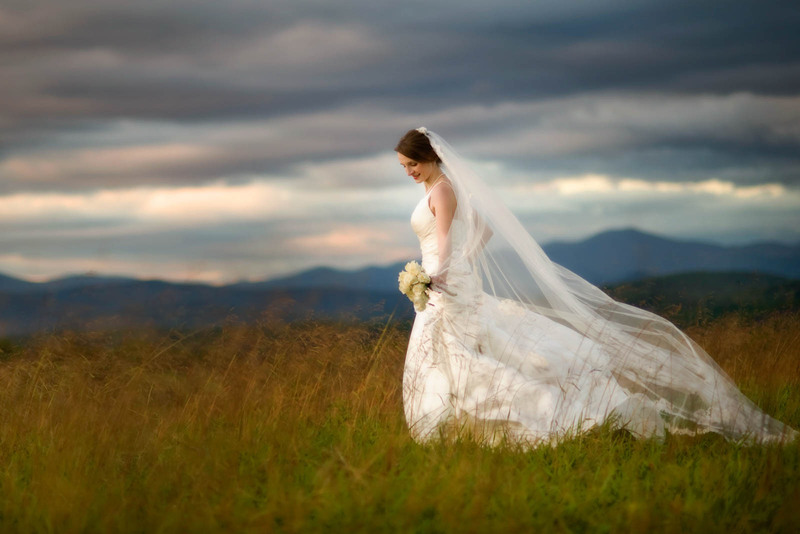 In this image, the bride is walking through a hayfield and you can see the Blue Ridge Mountains in the background. She is being illuminated by the light from the setting sun to the left of the image. Her veil and her gown are trailing and billowing behind her as she grasps her white rose bouquet in her left hand. There was a chance of thunderstorms that day, and the gray storm clouds create a dramatic backdrop in the sky.